Helicopter with water A helicopter takes off with a fresh load of water in the bucket. Helicopter bucket dip The Type I helicopter gets a fresh load of water from Horse Creek. Pump in stream A pump takes water from Horse Creek to refill tanks in the pumper trucks working the blaze. Burn area The fire quickly burned through this area on Thursday, with the fire growing from 30 acres to over 600 in just a couple of hours. Fire on June 21 The Horse Creek Fire started on Thursday, June 21, putting up a large column of smoke. This view is from 25 miles away, from just north of Marbleton. Editor Note: See June 26, 2007 - 9:00 pm update for more recent information and pictures. 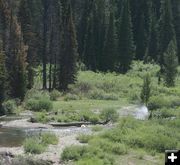 The Horse Creek Fire is burning on the Big Piney Ranger District of the Bridger-Teton National Forest. It is approximately 20 miles west of the town of Daniel, burning on the north and south sides of the Horse Creek Road. STATUS: As of around 3:00 PM on Saturday, June 23, the fire was approximately 765 acres in size and was being called 10% contained. According to Mark Randall, Incident Commander on the Initial Attack, fire managers do not have any projection yet for when this fire might be called controlled. The fire started around 3:00 PM on Thursday, June 21. There are no trail closures at this time. For fire fighter and public safety, the road is closed to public travel beyond the Horse Creek Snowmobile Parking Lot. Sublette County Sheriff's Office deputies are manning the road block, which is in place for public and fire fighter safety. Most of the fire fighting activity is basing off the Horse Creek road west of Sherman Guard Station. There are no structures threatened at this time. If the fire were to spread, there are old tie hack cabins interspersed in the forest that may be at risk on National Forest land, but are not presently threatened. 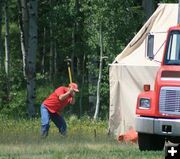 Fire camp is being set up in the vicinity of the snowmobile parking lot. There are currently around 200 firefighter personnel at the site. The fire intensity has been picking up in the afternoons due to warm-up from the heat of the day and increasing afternoon winds. Because of the terrain and spotting, it is difficult to get a solid hand or dozer black line around the fire at this time. Ground crews are being supported by the 3 helicopters to attack new spot fires and try and prevent the fire from going over the south ridge into the next drainage. FIRE BEHAVIOR: Some extreme fire behavior has been observed since the fire began. Warm temperatures and afternoon winds are working to spread the fire. The majority of the fire is on the north side of the Horse Creek Road. Torching trees in places is sending sparks over to the south side of the drainage and causing isolated spot fires 1/4 to 1/2 mile ahead of the main fire. The fire is creeping through previously burned areas of the old Mule fire and cleaning up fuels in that area. In other areas with more tree coverage, the fire is making occasional short crown runs. On Thursday, the fire grew quickly and 100 foot flame lengths were reported. 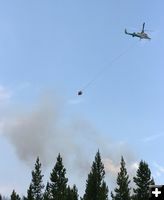 RESOURCES: Resources on the fire include 200 fire personnel, 10 fire engines (USFS, Sublette County and National Par Service), 3 helicopters (Type I, Type II and Type III). 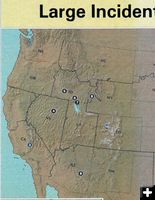 Personnel consist of 5 hand crews (including Centennial Type II Initial Attack, Big Horn Basin Type II, Teton Interagency Type II Initial Attack) 2 Sublette County Road & Bridge dozers and various overhead (including Pinedale and Big Piney Ranger District personnel). Two Type I Hot Shot crews are part of the hand crews working spot fires (Logan and Bonneville). OBJECTIVE: This fire is being managed for suppression. Fire managers want to keep the blaze east of the Pass Creek Road and between Horse and Pass Creek. CAUSE: The cause of the fire is still undetermined and currently under investigation. The fire appears to have started near the road, but no obvious cause has yet been identified. There are dispersed campsites in the vicinity of where the fire started, but no determination has been made as to whether the fire was human-caused, originated from one of the campsites, or started due to a lightnig strike in the vicinity. FIRE DANGER RAISED TO HIGH: Fire danger was raised from Moderate to HIGH today. There is little prospect of wetting rains in the weather forecast over the next few days to help crews put out this fire. CLOSURES: There are no closures at this time. The Forest Service is asking that traffic on Horse Creek Road be limited to fire personnel only for fire fighter and public safety. MORE INFORMATION: For more information about this fire, contact Mary Cernicek with the Bridger-Teton National Forest, (307) 739-5564. Photos by Dawn Ballou, Pinedale Online! Special thanks to Mark Randall, Pinedale Ranger District, and Nan Stinson, Big Piney Ranger District Fire Public Information Officer, for their help and contributions to this story. Old Burn Reburn A lot of the visible white smoke is coming from reburning of low ground fuels left from the 2002 Mule Fire. Creek Pump Smoke rises from a pump taking water from Horse Creek, filling hose lines going to crews on the fire. New spot Wind has carried hot sparks from the north side of the drainage starting new spot fires on the south side. Crews want to get these spot fires out quickly so the fire doesn't burn over this ridge into the next drainage. Hand crews, supported by three helicopters, are actively attacking these spots to suppress them. South Side Horse Creek The south side of Horse Creek drainage is composed of mature lodgepole and alpine fir trees. The north side is next to the 2002 Mule fire. This new fire is burning in a 300-acre swath that was unburned from the previous fire. Some reburning of fuels in the old fire area is occuring, putting out most of the visible white smoke that can be seen from town. Horse Creek trees The Horse Creek fire is burning in lodgepole and alpine fir trees. Justin Kaber-AFMO Justin Kaber, Acting Fire Management Officer (AFMO) on the Bridger-Teton National Forest, takes a call on the fire. Chad Hayward, Line Safety from the Pinedale Ranger District, sits beside him. 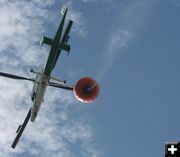 Hitting Spot Fires A helicopter dumps buckets of water on spot fires on the south side of the Horse Creek drainage. Hot Shot hand crews are on the ground working to suppress the fire. Big Piney-Marbleton Crew Wildland fire crews from Big Piney-Marbleton Volunteer Fire Department are helping with this fire. Woody Contracting helicopter This helicopter is from Woody Contracting Inc. Helicopter Bucket Drop One of three helicopters working the fire. Scorched trees The fire burned trees and vegetation right next to the Horse Creek Road. This is near where the fire started. Kendall Valley fire crew Fire fighters from Kendall Valley Volunteer Fire Department are helping with this fire. Sublette County firemen TJ Hunt, Sublette County Fire Warden from Daniel, talks with Brad Hall, Engine 7-1 Captain out of the Pinedale Ranger District. Dozer sits ready Sublette County Road & Bridge has two dozers on the fire ready to help. The terrain and spotting is making it difficult to put in a solid black line around this fire at this time. Horse Creek fire helibase The helibase for the Horse Creek fire is in a clearing along the Horse Creek Road close to the fire. Rotor Inspection The helicopters are carefully inspected and maintained. Cleaning Windshield The helicopter crew cleans the windshield before the next flight. Pinedale Fire Crew Pinedale Volunteer Fire Department has fire crews on this fire. Fire Camp Tents Fire crews have pitched their personal tents in a cool aspen grove adjacent to the snowmobile parking lot along Horse Creek. The crews work long shifts out on the fire, then come back to eat and sleep, then go back out on the fire again. Sink Kiosk Several of these sink kiosks are set up near the fire crew tents in fire camp. Setting up tents Crews from Big Sky Catering set up tents in fire camp at the Horse Creek Snowmobile Parking lot. Setting up mess tents Efficient crews work together and quickly set up the mess tents in the base camp. Pounding tent stake The crews had the catering tents up very quickly. Sink Trailers Private companies have businesses catering to the needs of wildfire crew camps. Big Sky Mobile Catering is helping with the Horse Creek Fire. This is a trailer with outside sinks near the mess (food) tents. Fire Information Board Current fire information is posted on boards in base camp so everyone knows the status. Fire Packs Backpacks are packed and ready to "grab and go". Chainsaws Ready Chainsaws are ready for crews to use on the fire. Hose fittings Hose fittings are all ready in boxes in the supply area. Cereal Boxes Until the catering tent and staff are set up, initial attack crews grab boxes of cereal for breakfast. Fuel Truck A fuel truck is on hand at base camp to gas up the trucks. Garbage is handled too Eidens Construction, out of Big Piney/Marbleton, is providing large dumpsters for base camp. Horse Creek Fire Map The fire is burning approximately six miles west of the Merna Junction, on National Forest land. Most of the blaze is burning on the north side of the Horse Creek Road. Some spot fires have started on the south side. Large Incidents Map-June22 Large Wildfire Incidents Map for June 22, posted in fire camp.